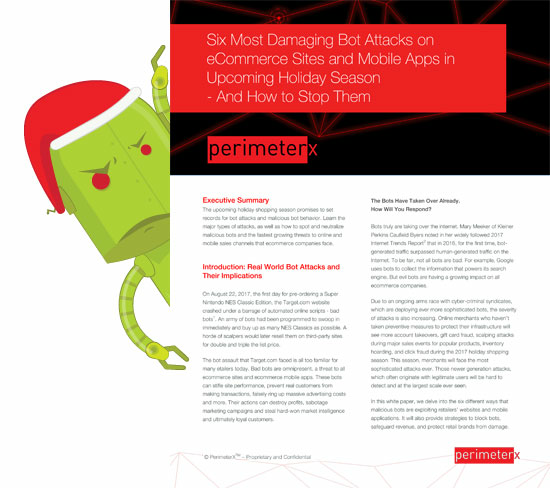 The Top 6 bot attacks causing the greatest damage to ecommerce revenue and retail brands in the upcoming holiday season will be account takeover, gift card and credit card fraud, scalping, hoarding, price and content scraping, and marketing fraud. What will these attacks by “Cyber-Grinch bots” cost retailers, ecommerce sites, and their customers this Holiday season? How can you stop even the most under-the-radar attacks - including those coming from the smartphones of innocent consumers, who don’t realize they are using a compromised or counterfeit version of your mobile app? Learn how to block all forms of bot attacks on your website and mobile app. Ruin the holiday season for Cyber-Grinch bots.